1 of 6 Heat nonstick Belgian or standard waffle iron. 2 of 6 Combine flour, sugar, baking powder, baking soda, cinnamon and salt in large bowl. 3 of 6 Beat together banana and eggs in medium-size bowl. Beat in butter, buttermilk, vanilla and pecans. 4 of 6 Make well in center of flour mixture. Add banana mixture to well, stirring quickly, just until blended. 5 of 6 Coat waffle iron with cooking spray. Spoon slightly rounded 1/3 cup batter for each 4-inch waffle onto hot iron, quickly spreading to cover entire surface. Cook following manufacturer's instructions. 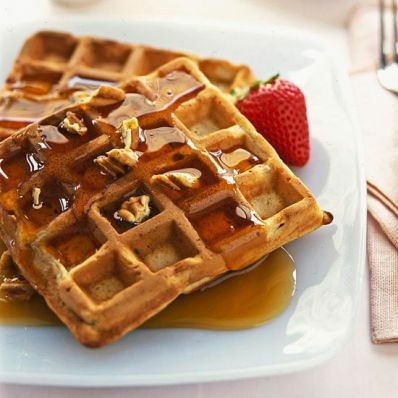 6 of 6 Serve waffles hot with an assortment of desired toppings. Per Serving: 2 g fiber, 4 g sat. fat, 245 kcal cal., 218 mg sodium, 66 mg chol., 11 g Fat, total, 31 g carb., 6 g pro.